Use a pizza stone to kick up your pizza to the Next Level. What is a pizza stone? A pizza stone is a ceramic or clay insert that goes into your oven. The pizza stone in your oven mimics a stone or brick pizza oven. With a pizza stone you are able to cook your pizza completely and quickly. Pizza is meant to be cooked in an extremely hot oven. That is 500 F + (260 C +). The biggest mistake people who use a pizza stone, is to not pre-heat it long enough. The best tip I can give you if you are using one is to make sure it is heated up for at least an hour in your oven. Many people make the mistake of using a pizza stone to cook pizza, but unless you pre-heat your stone long enough, you will not get satisfactory results. If you are going to make great pizza you need the right tools. Most of the tools for making pizza will be found in any kitchen. Mixing bowls, measuring spoons and a cookie sheet, are really all you will need to make good pizza. If you want to make great pizza, think about getting a pizza stone. You can get away with using tools found in any kitchen to make pizza. There are a few tools that you will need if you want to make home made pizza. Mixing bowls, measuring spoons and a pizza pan or cookie sheet are essential. Think about this: the best pizza is made in a coal fired over, wood fired oven, or a professional deck oven. While it would be great to own a coal or wood fired pizza oven, this is not practical for many of us. The answer is to claim your own pizza stone. A pizza stone, (also known as a baking stone), and a pizza peel are essential to make great pizza. You will also want to use a pizza paddle, also known as a peel. Dust your peel with cornmeal or flour so ou pizza will slide on and off your pizza stone. The best pizza is made in a stone or brick oven. A pizza stone attempts to recreate a brick oven in your home. The notion behind this is that the pizza stone will absorb the heat in an oven. And then transfer that heat to your pizza. A pizza stone will cook your pizza quickly and evenly. One of the most important tips for using a pizza stone is to pre-heat your stone for an hour or more. The biggest mistake made by home pizza chefs is not allowing the stone to heat up long enough. You need to heat up your oven to at least an hour or more. That way the stone will absorb all of the heat being generated by your oven. My friend Jon F. tells the tale of how not to use a pizza stone. His friend heat up their oven to 500 F. (260 C). and let it pre-heat for at least an hour...after to oven was hot, they put the pizza stone in. And they were dissatisfied with the results. You need to have your baking stone in the oven when you turn on the oven! Before you turn on your oven, make sure your stone is in the oven. Your pizza stone should pre-heat at least an hour before you put the pizza on it. Another great method is to use pizza stones is as barbeque pizza stones. You can enjoy your pizza right from a barbeque grill. You can find a wide variety of cheap pizza stones, but believe me cheap is not always better. Here's why: cheap pizza stones are made of inferior quality materials. While you may save a bit of money in the short term, in the long run a cheap baking stone will end up costing you more money. The best pizza stones are made of high quality materials and will come with a warranty. Many pizza stones will cook your pizza just like a brick pizza stone oven. I have had my pizza stone for over 20 years and have found it to be practically maintenance free. With repeated use it has turned almost black and continues to work well! I always let my stone cool down before cleaning it. For every day cleaning, I just wipe the stone, with a slightly damp cloth. This will remove all of the cornmeal or flour that has stuck to the stone. If I have something baked on the stone, like cheese or a piece of dough, I will gently scrape all the residue I can get off with a spatula. If I am unable to get it clean, I will heat the stone in the oven for at 500�F+ (260 C) degrees for an hour or more, let the stone cool and then try again to gently scrape the stone. Heating up the stone will burn off anything that has stuck to it. Then just wipe down with a cloth. as the taste of the soap will get into the stone!!! What to do if your pizza sticks? If your pizza sticks to the surface as you try to move it to your cookie sheet or Pizza Stone ! , slide a knife underneath to loosen it. Remember next time to use enough corn meal or flour underneath so it will slide. Another trick to loosen dough is to use a piece of dental floss (wider than the pizza), and slide it under the dough. The "dental floss trick" has saved many "sticky" pizzas! Master Pizzaiolo, Jon F. explains the single most important aspect of using a pizza stone. And there you have it. Simple, easy and straight forward. I highly recommend that you invest in a pizza peel and a Pizza Stone . Don't be intimidated about using a pizza stone or peel. As with anything else it just takes a bit of practice to master. The art of using a peel will really take you pizza to a new level. Make sure that you put enough flour or cornmeal underneath your dough so it won't stick. 1) The warranty. You want your stone to last at least 5-10 years. 2) Look at the thickness of the stone. Your baking stone should be at least 1/2 inch thick. 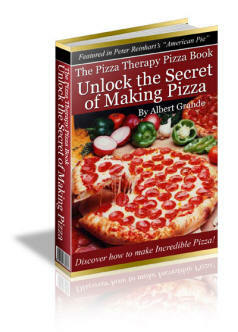 The Pizza Therapy Pizza Book. Videos, book reviews, and more. All different, unique information.